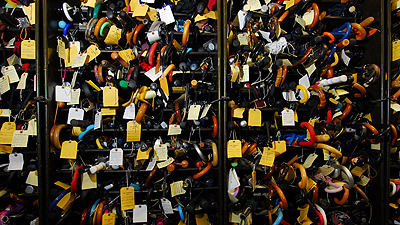 Transport for London's Lost Property Office is celebrating its 75th birthday with a public showcase of some of the more unusual items left on the London Underground & London's buses. Weirdly people have left behind (and not claimed) a park bench, WWII gas masks, a stuffed fox, a puffer fish, a lawnmower and even a home vasectomy kit. Umbrellas are amongst the most common things left behind. However, laast year the most commonly forgotten objects were books (36,852), bags (28,550) and items of clothing (27,174). It was also interesting to see that a quarter of a million pounds worth of luxury watches have been among the office's items. If they're not claimed within three months they go to charity or are auctioned. The Lost Property office manager Julie Haley said that any personal data left on an item will see it kept permanently though, and she advised the public to always check with them. "I know some people think if they have lost something on public transport they will never get it back," she told Sky News. "But I would like to encourage them to give us a call. 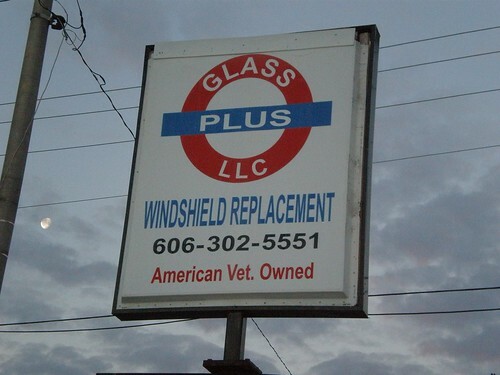 You never know - we might just have it here." A pair of breast implants were successfully re-united with their owner. Fortunately I've never left anything much more than a cardigan, jacket and loads of umbrellas behind on the Tube. Funnily enough someone left a pair of designer glasses on a bench at Hammersmith Tube this morning & I hope they made their way back to the owner. Have you ever left something and got it back from the lost property office? What's the weirdest thing that you've found or handed into staff? In theory they're a good idea, but you're not at all as exposed when you're travelling on a bus. At most one other person is likely to see the badge, if they're sitting next to you and it's not like being on the row of seat on the Tube where at least five or six people sitting opposite you would be able to see you nodding off. However, I do like the badge format for them rather than the stickers. They seem much more drool proof. The badges don't appear to be on the WakeMeUpAt site yet, so I'm guessing you can only get them in shops. If you manage to grab a picture of someone wearing either a badge or a sticker, please let me know, as I'd love to see if they work. It would be interesting to see how long people have to travel wearing one. 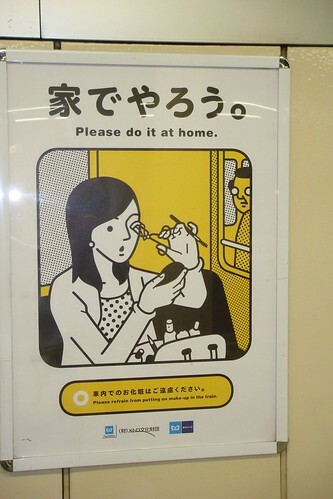 Even something as in your face (quite literally) as the Japanese subway sleep mask didn't work. The passengers let the poor guy sleep on and never woke him. But with badges you look at less like a weirdo and less likely to be part of some art installation or "You've been framed" stunt. 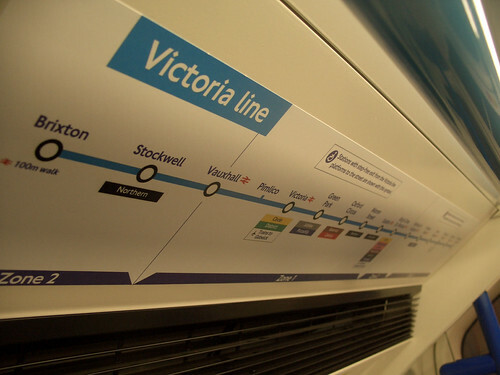 Bad news if you want to use the Victoria Line from 9.30pm on the 5th October as RMT members will walk out for 24 hours. They claim that management have gone back on an agreement to reduce the number of return journeys a driver has to make in one day. Bob Crow, general secretary of the RMT, said: "This underhand attempt to extract an extra 20% from the working day out of our members has provoked this action on the Victoria Line and we would urge the management side to re-open serious negotiations to resolve this issue." There's a chance it might be called off, as it does sound from that quote that he's willing to talk. Tired of your blue generic travel card wallet? Want something that's more personalised or important to you? Now you can get wallets, and also mugs, mouse mats, coasters & T-Shirts with a part of the London Underground map that's special to you on it. Including the river! 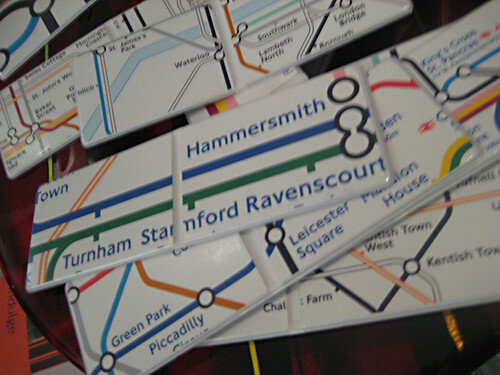 Thanks to London Transport Museum with the click of a mouse you can grab part of the Tube map and get in printed on a range of products. Last night they launched their "RailOrder" series (see what they've done there). 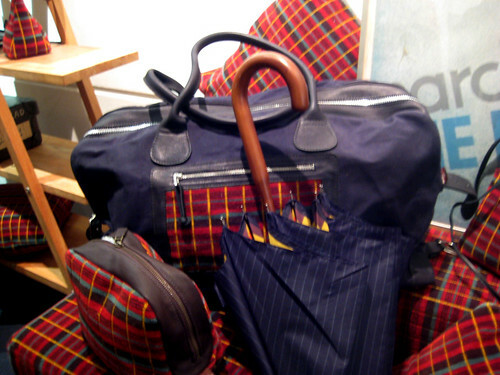 They're part of a number of lovely items which let you carry a bit of London Transport around with you. At the moment the travel card wallets don't seem to be on the site, but the samples I saw last night looked really hard wearing and like they'd withstand several years worth of swiping. 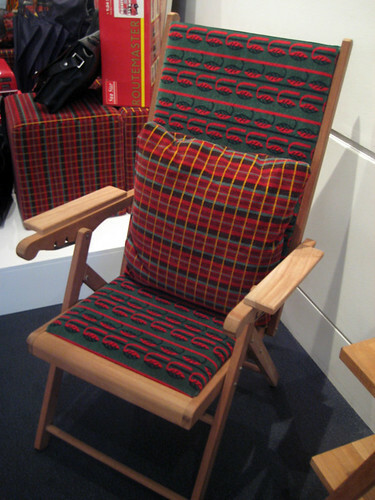 There's even a furniture collection, if you love the feel of sitting on Tube & bus seats so much! I'm told they don't come with added chewing gum and crisp crumbs. It's great to see the Museum offering items like this. Particularly the personalised map products. I'm told they'll be looking at ways to increase the personalisation even more in the future. It might not extend to changing the names of the stations, but it wouldn't take a big stretch to allow people to personalise messages to the Tube stations of their choice. "Nearly home" or "Back to the office" or "Great pub stop", would make them even more personalised. Update: Alex Gollner's been playing around with the tool and has come up with some nice looking T shirts really zooming in on certain intersections. See if you can guess where they are. Can you read these Central Line stories? Sometimes I think that art on the London Underground ought to be sponsored by brands. The piece below would be a perfect candidate for Specsavers. Even if you had time to read the stories on this poster, you'd need to have incredibly good eyesight or certainly need a pair of glasses at the end of it. Helpfully though you can read and even hear some of Sarah Butler's stories online. Similar to the project where a photographer has taken pictures of staff from each station on the Tube system, staff on the Central tell small stories. 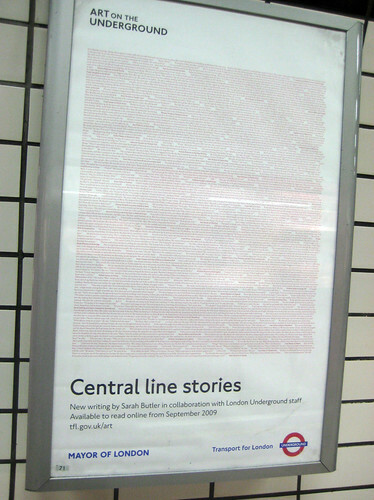 "Central line staff guided Sarah, introducing her to their colleagues and recounting personal tales. These initial conversations highlighted a very human desire to communicate through storytelling. Together these stories offer the reader a glimpse into the rich imaginations, cultures and experiences of the London Underground staff who you may well encounter on your next Central line journey." Certainly more interesting than hearing them saying "Stand clear of the doors" or "The next station is Snaresbrook". 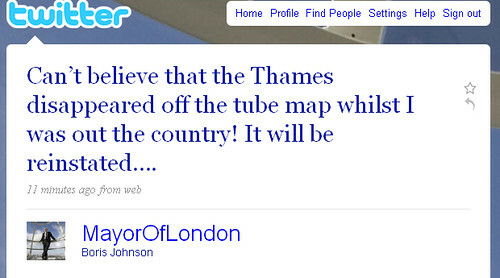 Apparently Boris Johnson was outraged to find that the Thames had disappeared from the new London Underground map and has demanded that it be returned. Paul Waugh from The Evening Standard blog said of the Thames' disappearance: "I can't for the life of me think what possessed the TfL people to consider this. Did they really think that Londoners are so stupid that they imagine the strip of blue is a new Tube line? Did they not have any feeling for the history of the beautiful Harry Beck design? Did they not stop to think that actually many Londoners divide the city into north and south of the river and therefore it is essential to any map? Anyway, Bojo has saved the day. I'm told that he was amazed at what had been proposed while he was away and has now ordered that the Thames should be reinstated as soon as practicable. 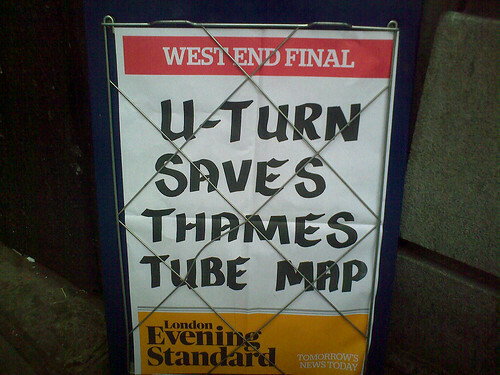 Apart from anything else, Boris wants to increase the river's role as a transport link with the Underground network." At the moment there's nothing on TfL's website to confirm this. 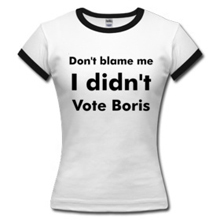 Although Boris Johnson has just Tweeted that it will be back. There's also no word as to whether the zones will return. But by all accounts by December the river will be back at a cost of £80,000. Sorry I haven't done these for a while, but here's a collection of Tube roundels not on the London Underground. I must thank everyone over the years who's taken the trouble to spot these little blighters "in the wild" away from their natural homes in London. 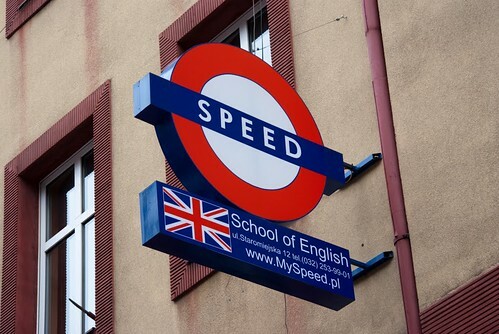 It's from an English school in Katowice (pronounced Cat-O-Vit-Sa appararently) in Poland which he visited over the weekend. 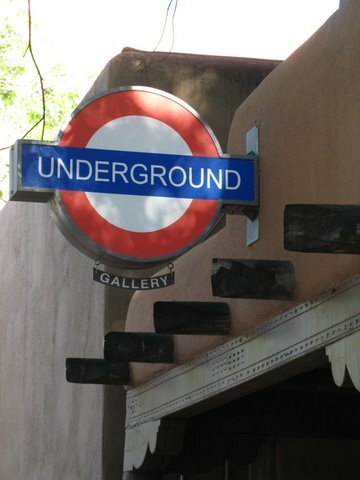 "This one's on the front of a gallery on Marcy Street in Santa Fe, New Mexico. Note the adobe and vigas -- typical southwestern U. S. architecture. 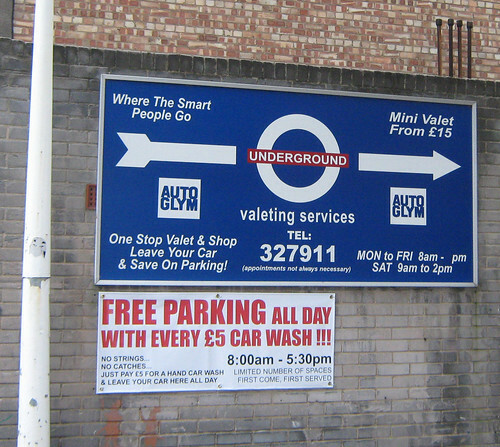 Not the kind of place you'd expect to find the Underground roundel." Nicely spotted by M. J. He said "I spotted this recent when I was on holiday in Sydney, Australia. Sydney doesn't have an underground metro system (at least not yet), but some of the stations on the central loop are below ground. Wynyard is one such station, which is where I took the picture of the Concourse Bar. 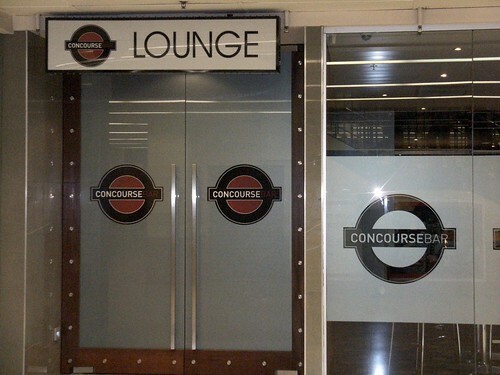 I didn't have time to go in the bar unfortunately, but I'm guessing that the use of the roundel is likely to be a nod to the fact the bar is in a below-ground railway station. It didn't look particularly well patronised!" Thanks to you all and if you'd like to see more of Roundels not on Underground they're here. If you spot any in the flesh on your travels, please send them in to me and I'll blog the best in a future post. There's been quite a major change on the new London Underground map. Blech took a photo and said he thinks "it's the most radical change it's had in at least one decade, possibly even two. Has someone been reading Maxwell Roberts?" It's also gained more stations marked as interchanges (eg Paddington, West Hampstead) while Imperial Wharf is also there ("opening late 2009"). If it wasn't for the wheelchairs, this would be the most minimal pocket map ever." There's already a lot of discussion about this on Blech's Flickr thread. version-3-point-1 said it's "an attempt to make it less cluttered, the Gods from on high told us! LUL opened up a forum for us staff to offer feedback and as far as I've heard, quite a few of my colleagues have made nothing but complaints!" What do you think? Is it more helpful now it's less cluttered? What about the loss of the river? And the loss of the zones, is this a help or hindrance? From today, Friday 11th September, a new collection of posters will be unveiled on the London Underground. ELLE are working together with TfL to celebrate the 25th anniversary of London Fashion Week. They've got designers who've helped shape British fashion – from Paul Smith and Christopher Bailey to Henry Holland and Naomi Campbell – to create the one of posters which will be at central London Tube stations this month. "We're very proud of our tradition of putting great design at the heart of our organisation. This includes the iconic and world-class design of our stations, signage, maps, typeface and posters. We have always been committed to new ideas and leading design." Five of the posters have been made into covers for ELLE magazine and these collector's issues can be bought at from WHsmith and Selfridges. More details here. For me it was a shame that the posters weren't a bit more London focussed or had a few more nods to the Tube. 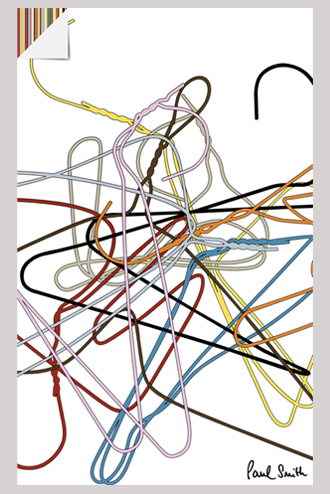 But I love the one above from Paul Smith with the tangled hangers looking a little like a mad Tube map. Speaking of fashion on the Underground, mondoagogo had a great spot the other day of a person who seemed to get her footwear to match the Tube seats. For a second I thought they were those shoes made out of moquette, but they're just an amazingly good match! Remember the animals on the Underground - animals that have been "found" in the Tube map. Well, this got regular contributer & commenter Jon Justice thinking about whether you could see anything else in the London Underground map. Letters for example. 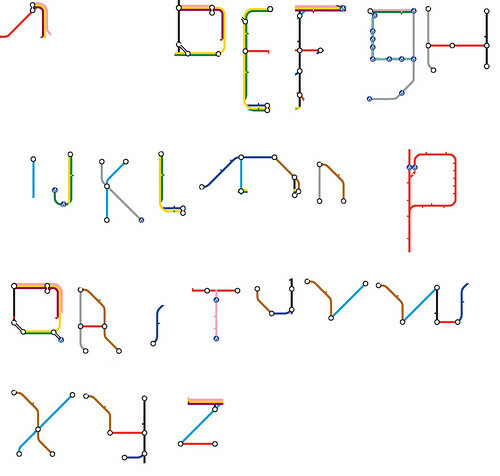 He was sitting with a friend on the Tube and she insisted that she could see letters - almost a whole alphabet. "So we ended up sitting down in the pub trying to trace out the whole alphabet. It's harder than it sounds. As long as you mix upper and lower case, you can get most letters, but some we just couldn't get at all. B, C and O eluded us entirely (at least not without making them huge) and we're not at all happy with A or S and we had to cheat and use the DLR to get a G. The M is pretty ropey too." he said. I think it's a very good attempt- although I'm surprised they couldn't get a better S! Do you think you could find the missing letters? Or have you seen anything appearing in the Tube map if you stare at it too much? Should ghost Tube stations be resurrected? There's been a couple of Londoners in the news lately who've been making moves to get some of the system's 40 disused London Underground stations opened. If you're lucky you might be able to get on the odd tour of Aldwych station, but they're few and far between. Adrian Davies lives close to the old "Brompton Road" Tube and believes there's a case for opening it, and not just from a historical viewpoint. He told the BBC in the film below, "While this station saw little passenger traffic in the 1930s times have changed. There are a lot of tourists, a lot of shoppers, I think it would be a busy station today and take some of the pressure off other stations on the line." "I have created a company that is planning to open up the 26 disused ghost stations underneath London as 'tourist adventures'. So far my proposal has been very warmly accepted by the Mayor of London; the transport commissioner has handed it to the MD of the London Underground. I have offered to raise the capital myself to start the pilot station as an operational proof of concept and am waiting for the Mayor of London to give me the go-ahead to send my survey team down into the first station." He seems quite determined and I wish him luck with his endeavours - which you can read in full here. Although I don't think he should hold his breath. The party line from TfL isn't in favour (warm acceptance from the Mayor aside). Howard Collins from London Underground said "To make them safe, even for visits, requires a lot of resources and special arrangements. "Our focus is upgrading the system. We are spending billions of pounds of investment: upgrading with new trains; adding air-con trains on some lines and working on track signalling." What do you think? Would you like to see some of these stations restored to their former glory? Do you think it's worth the expense? Which stations re-opening could actually help take pressure off other stations in the network? 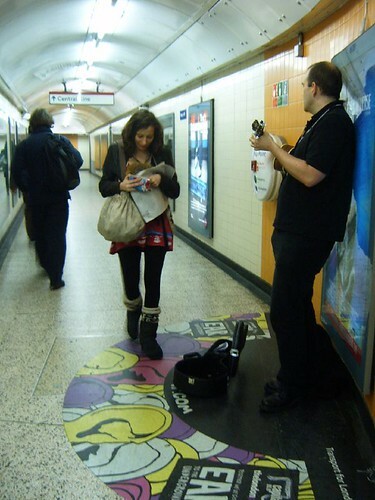 CBS Outdoor are looking for brands to take on sponsorship of the 35 mini stages for licensed buskers on the London Underground. The spots are available from November and apparently can be tailed to suit the sponsor. Specific music genres or themes can be built into the sets or branding can be expanded above ground or linked to other media activity. Donna Price, from CBS Outdoor, told Media Week it offers the chance for clients "align their brands with music culture and to play their part in brightening up journeys for passengers". It would be great to see some imaginative sponsorship of these sites and I wonder if one brand will take it on or if it will be open to many? A while back there was talk of labels experimenting by getting buskers to play certain songs. Perhaps something could be introduced where even commuters can decide what they'd like played at each station. 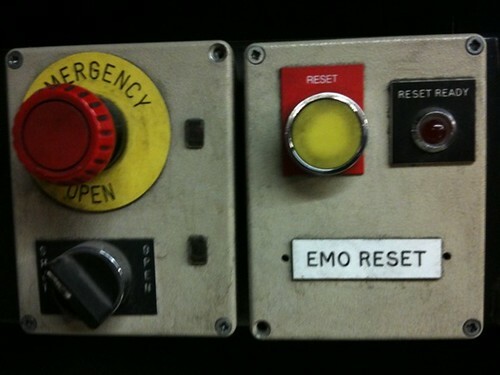 Is this button for when staff on the London Underground feel themselves going a bit goth? Or for when they see too many Emos on the Tube? This photo taken by Rhys Isterix got me and a lot of other people on Twitter, thinking. Someone must know what it's really for. So please let us know otherwise I'll just have visions of seeing a Punk reset button, or an Indie reset button at certain stations on the network. People living in Golders Green have created a series of walks about what their suburb means to them to tie in with the London Transport Museum's latest temporary exhibition Suburbia that opens on Oct 15th. 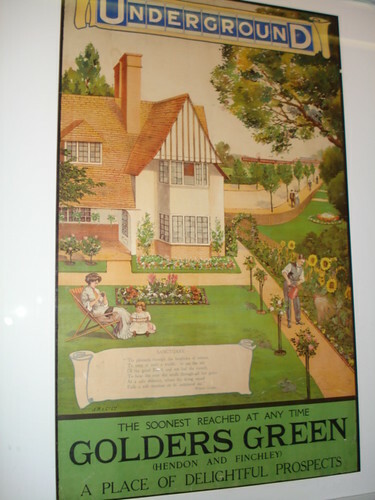 Golders Green was apparently the first Tube-created suburb in 1907 when the green fields of Golders Green were transformed by the coming of the Tube. The locals have created three walks along the themes of tasty places to eat, places of reflection and green spaces that highlight the diversity of their community today and what makes it unique. Free guided tours are happening from 8th September, (bookable online or over the phone on 0207 565 7298), which start at Golders Green London Underground Station. There are pdf self-guided walks that can be downloaded from the London Transport Museum's website. There will also be an interactive map that people can add their photos to, coming soon. We've had many a discussion about people putting make up on the London Underground. Commenters on this blog generally aren't wild about it. But what about nail clippings? What's acceptable "grooming behaviour" on the Tube? Zoe and Carolyn broadcast a podcast last week - 2peaspodcast - where they discussed what people did on the Tube and public transport. Zoe made the great point that people seem to think they're in a bubble that makes them invisible when they travel. Have a listen at about 6 minutes onwards & let us have your thoughts. Is it better if people apologise or look slightly furtive? 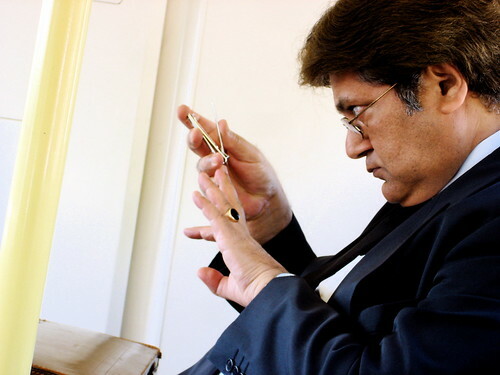 Is nail clipping or filing worse then make up because "deposits" are left behind? Is there something about the noise that makes it bad? Do you think TfL will or should start up some signs about "bathroom habits" on the Tube? It's already happening in Japan. 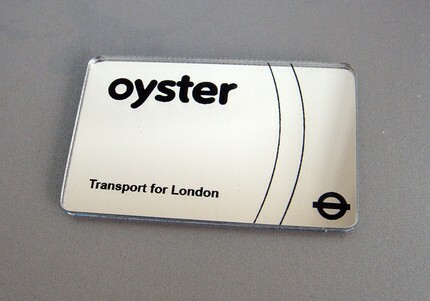 Fed up with your blue plastic Oyster card? 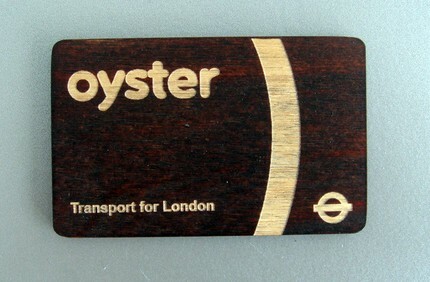 Someone over at Etsy has produced some alternative Oyster cards covered in wood and mirrored plastic. When I first looked at them, I thought that they'd gone down the dissolving Oyster card route and inserted the chip in the new cards. But it's not the case. The Etsy seller says "Due to its magnetic functionality, the casing does not affect the function of the card in any way and so can be topped up and swiped just like any regular card. Each card comes with its unique ID included for registration as is accepted at every underground cashier desk I have ever been to." Thanks to Vikkichowney who originally spotted these on Notcot. Surprised no one has thought of doing this before and I love how they're scratchproof, as my Oyster card has really been through the wars. Probably worth getting one while they're hot, as it might only be a matter of time, before Transport for London say "down with this sort of thing", as they did with the Oyster card wands!